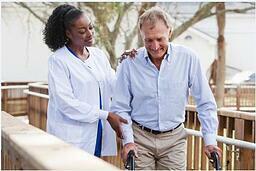 According to the National Stroke Association, over 750,000 people suffer from a stroke in the United States. Simply stated, a stroke is caused by a lack of blood flow to the brain, when an artery becomes blocked or bursts. As the brain is deprived of oxygenated blood, cells begin to die and cause permanent damage. With ¾ of a million Americans suffering from first-time, or recurring strokes, there is an ever-present need for in-home care of individuals who wish to remain in their homes following a stroke. Like many other conditions, strokes can cause a unique set of conditions after an occurrence. For instance, impairment on one side of the body may cause individuals to require assistance with ambulation, walking, or mealtime. When focusing on creating a stroke specialty within your home care agency, take the time to research common side effects of stroke, attend online or local training sessions and speak with resources, like geriatric care managers, to learn about common needs that have been encountered in real-world situations. By learning the common needs of stroke clients, and incorporating the right questions into your assessment forms within your agency’s home care software or home care system, you’ll be positioning your agency for a successful experience with clients. By dedicating particular intake coordinators and caregivers to stroke cases, you’ll be able to offer well-trained, and experienced, staff to help individuals that have suffered a stroke, and their families, feel at ease. For example, an intake coordinator that has been trained on common effects of stroke and needs of stroke patients will be able to ask a set of questions in their initial assessment that will create a comprehensive care of plan tailored to reducing the impact of a stroke’s effects. By noting items like dietary restrictions due to trouble eating within an agency’s home care software or home care system, and assigning a caregiver with stroke care experience, clients are likely to be more satisfied with the type and quality of care received. Additionally, take advantage of the ability of a robust home care software or home care system to match caregivers to clients based on caregiver qualifications and needs of new clients. To market your stroke-specific services, develop a referral network with other care providers that often see senior individuals that have suffered a stroke. Consider networking with neurologists, physical therapists, geriatric care managers and local chapters of organizations like the National Stroke Association to gain new business. Track referral sources and prospects with the assistance of a home care software or home care system, like ClearCare, to ensure that your relationships remain current and productive. With dedication, knowledge and effective management assisted by a home care software and home care system, your agency can grow its client base and become the go-to people for private duty stroke care.